Smok Tech has come out with a new variation on the cartomizer called the dual coil. These cartos are outwardly similar to standard mega cartomizers, but beneath the stuffing lies a coil arrangement that is anything but ordinary. Rather than a single coil, there are two separate coils in a parallel arrangement running lengthwise through the filler material. The individual coils have a higher resistance, making them less prone to scorching. When combined they create a lower resistance and larger surface area that creates excellent warm vapor with little flavor sacrifice. I recently purchased some dual coil cartomizers from Hoosier E-Cig Supply in a 1.25 ohm version and was absolutely amazed by them. They’re easy to fill, last a long time and produce great vapor. They work well on an eGo at 3.2v but really hit perfectly on the slightly higher voltage of an unregulated mod, particularly on a fresh battery that’s producing a little more than 4v. I have to add a disclaimer here; some users have had battery failures using LR atomizers and cartomizers on regulated batteries like the eGo, although I have not had any issues. 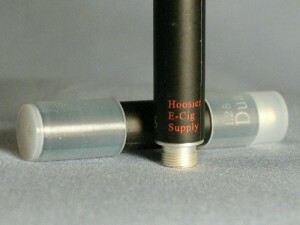 Hoosier E-Cig Supply also stocks a 1.5 ohm version that provides a similar if slightly less intense experience. 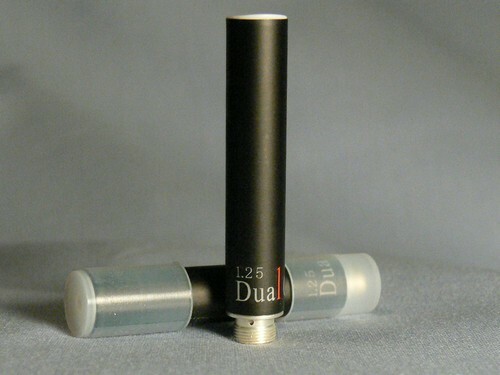 The dual coil cartomizers can be filled using a number of methods, just like a typical carto. The cap fill method, where the cartomizer is pushed into the rubber cap filled with juice works well. 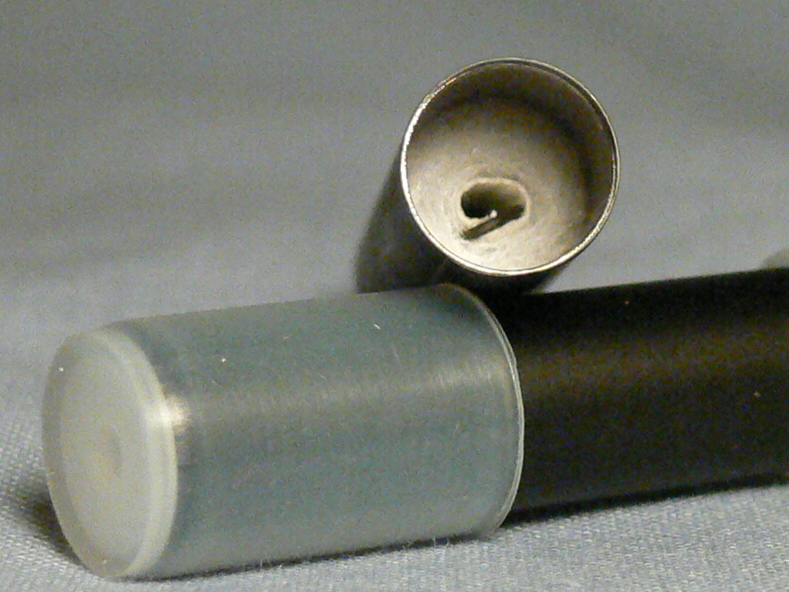 The included caps do not hold enough fluid to completely fill these larger cartos, however, making repeated fills necessary. Dripping into the battery end works also, but I think the easiest method by far is filling from the mouthpiece end. The flexible mouthpiece tip is easy to remove and liquid can then be dripped into the cartridge when holding it at an angle. Keep dripping until the filler looks saturated. These cartomizers hold a whopping 1.7ml, so they last a long time between fills and can be easily topped off as needed. As with any mega cartomizer, the increased volume comes at the expense of size. At 45mm, these add significant length to the typical electronic cigarette. And like most cartomizers, they are just a bit too wide to fit the opening in an eGo or Riva cone. Removing the label should make them slim enough, but that tends to be a sticky process. Speaking of labels, a well designed red and white logo at the base displays the Hoosier name and 1.25 ohm rating adds a touch of class to these cartos. Cartomizers have always been an option for me only when dripping was not a possibility, but these cartomizers have changed the game. Instead of relishing the satisfaction of being able to drip after using a carto for awhile, I am now finding myself using these all day long. I’ve used one of these for over a week now with it only now starting to show some signs of degrading. At $2 each (and they do sell them by the piece) from Hoosier Ecig Supply, if I get a week or more out of each of these, the LR atties may just have lost their top spot.